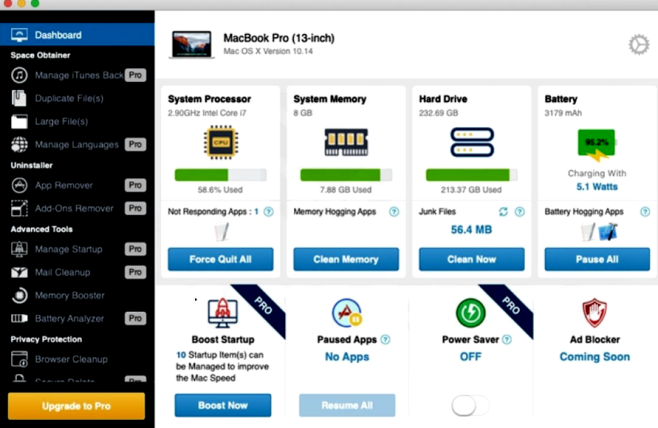 What Is Smart Mac Cleaner? Smart Mac Cleaner is potentially unwanted application that claims that several problems were detected on your Mac. If you try to fix these problems, Smart Mac Cleaner will tell you that you need to buy full version. Our article will help you deal with this problem and remove Smart Mac Cleaner. Please, read on. How does Smart Mac Cleaner get to your computer? Smart Mac Cleaner can be easily downloaded from the Internet because it is advertised on various sites. However, in most cases, Smart Mac Cleaner penetrates the system without knowledge of users. Developers claim that Smart Mac Cleaner fixes problems on your device, detects damaged files and even malware. But instead of cleaning the system, this tool suggests installing full version of this system tool. Unfortunately, Smart Mac Cleaner delivers intrusive commercial content and causes redirects to questionable sites. Of course, Smart Mac Cleaner claims that it can improve memory, battery and processor of your device, but these are just tricks. It can easily change your data to show problems with your files. To quickly remove Smart Mac Cleaner from your Mac OS you may run a scan with Combo Cleaner; it is a good program that may be able to remove Smart Mac Cleaner from your Mac. Go to Applications folder and delete Smart Mac Cleaner and other new and suspicious apps. Remove Smart Mac Cleaner and another suspicious extensions, then change browsers’ homepage, new tab page, start page and default search engine.